Over the past month or more I admit that I have been neglecting poor, ol' Battle Medic, and not without more than a little guilt. I have not, however, been neglecting the game entirely. I have been sneaking and conspiring, negotiating and stealing rare moments to indulge in Azeroth playtime whenever there was an opportunity. And the majority of that time has been spent blowing stuff up. Mage-style. Warlocks beware. My little gnomish pyromaniac has slowly and painstakingly progressed into the mid-60s and is slogging through the mire that is the Outlands. Anyway, today was a good day. 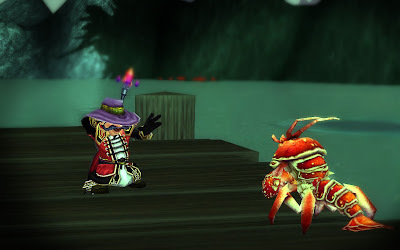 I have been intermittently fishing the high, lonely lakes of Terrokar Forest for the Mysterious Mr. Pinchy for a long time now. Every single skill point in Fishing that my Shaman has achieved has come in the futile hunt for this nearly-mythological crustacean. But no luck. Never even a sniff. Well, the fact that it took me a month to see your comment probably gives a good indication about how much time I have to dedicate to the blog these days. It's sad. On the other hand, I haven't given up on it. So, the short answer is that it is not active at the moment, but I am hoping it will be revived at some point. The biggest problem I have is that I'm not really raiding or doing any of the things that I used to talk about so I'm struggling to come up with topics to write about. Still, good to know you're still around. Are you playing again?